Posted on January 20, 2017 by Tom Richardson Posted in Cell phone & Computer Monitoring Reviews . Social networks and mobile chats are getting more and more popular. It’s risky for teenagers, cause sexting and bullying, unfortunately, became one of the realities of a modern world. No matter how hard you try, you can’t fully protect you kid. Besides, you’re afraid to let him or her know you’re interfering his or her privacy. Is there any chance to change the situation? Well, probably Teentor can help you. It will help you prevent disasters and will keep you informed whatever happens. You’ll be the first one to know about the activities of your kid on the phone and in the net! GPS – your kid’s location is not a secret anymore. You’ll always be aware of where your kid is and what he or she’s doing at the moment. If you’ve got no possibility to track your child at the very moment of his or her absence, all info is saved in your personal account, where you can follow your kid’s movements every single day. Surfing the Net history – it’s everything you need to know about everything searched for on the target device. Software – it’s easy – Teentor fixes time when this or that app was used via windows, iOS or Android. Restriction – restrictions of certain websites and apps are available on the target device. Screenshots – this option allows you to make screenshots of activities carried out on a target device whenever you think it’s necessary. Keylogger – every single key tapped is logged and that’s the simplest way to get all passwords entered, all published posts and every single message. Safe search – gives a possibility to filter search results from unwanted websites. Restrictions according to the age – uses basic restrictions to protect your teens from unwanted info, media and apps. SMS – getting all types of messages into your personalized account. You’ll get not only sent or received messages, but info on the time the message was sent or received plus contacts of those trying to connect with the owner of a target device. Calls – all types of calls. The control panel of Teentor will keep you informed about your child’s communications and about the amount of time spent on chatting. Contacts – every single contact the owner of the target device gets in touch with will be saved into your Teentor account. Restrictions of time – makes it available to fix time that your kid is allowed to spend surfing the net. It’s available 24 hours a day via e-mail, telephone or online chat – just visit the official webpage of the app to check this out. Whenever you need help, write a letter to experienced specialists on the official webpage of the app. You’ll get an answer within a few hours directly on your e-mail account. Just fill in the web form on the official webpage of the app and you’ll get the answer. Don’t forget to leave your e-mail address to make it easier for Teentor specialists to get in touch with you. Security. Gets about $60 for three months and about a hundred a year. All options available for 20 users at a time. Screenshots are taken every 10 minutes. 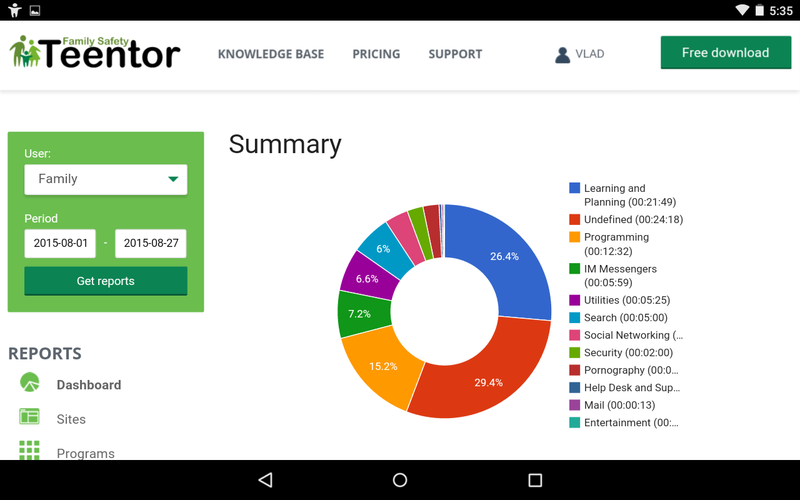 Teentor is compatible with iOS, Windows and Android. Works on multiple devices including phones, tablets, PCs and Macs. Getting a refund is as easy as pie! Just contact Teentor specialists to let them know that something has gone wrong and they’ll help you get your money back as soon as possible! It generally takes ten days. + Teentor doesn’t cost much in comparison to a number of tracking services. It’s stable. Functions it suggests are perfect to control your kids’ communication and addiction to games and social networks. – There are actually no visible disadvantages of the app – everything depends on your personal needs. The pricing is affordable and the app itself is easy to use. The only thing you should always remember, that no app can be installed remotely – you’ll always have to get access to the target device if you’re willing to install Teentor. Easily controlled app with a number of options available. Easy to install and use whenever you really need it. Your kid will be controlled and will never know about it. Teentor will keep you informed about all habitual activities your kid does in the internet including chats and communication in social networks. The list of options is huge and depends on the type of your subscription. Connect with one of the operators to specify the options you need to get and their pricing. Teentor will help you protect your family’s privacy giving you a chance to behave like any normal caring parent will behave. Nice app. The cost is reasonable. The best thing is that it works perfectly. Thanks for flawless performance! Now I know what my teen daughter is into. Always thought it to be disrespectful to the teenagers, but when my daughter and I got stuck in a horrific situation with her classmates blackmailing her, I had to take lots of things under my control. A friend of mine suggested using Teentor in order to delete undesirable messages and emails from my daughter’s device before she reads them.